Hope everyone had a wonderful Diwali! I tried Basandi for the first time and it came out very well I was debating between Badam halwa and Basandi, and finally decided to make Basandi as our diwali dessert! 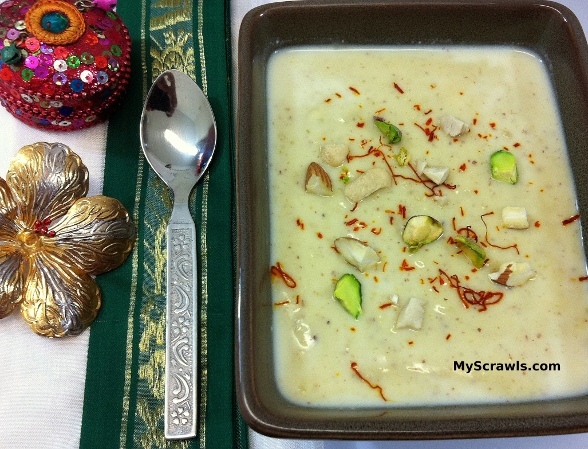 Basundi is a traditional Maharastrian dessert recipe prepared with milk, nuts, sugar and saffron. I first tasted this recipe in hotel Saravana Bhavan, Chennai. Must admit it was love at first taste This recipe was introduced to me as “Basandi” though its originally referred as Basundi. Whether you call it Basandi or Basundi, am sure you would definitely like this traditional milk sweet! 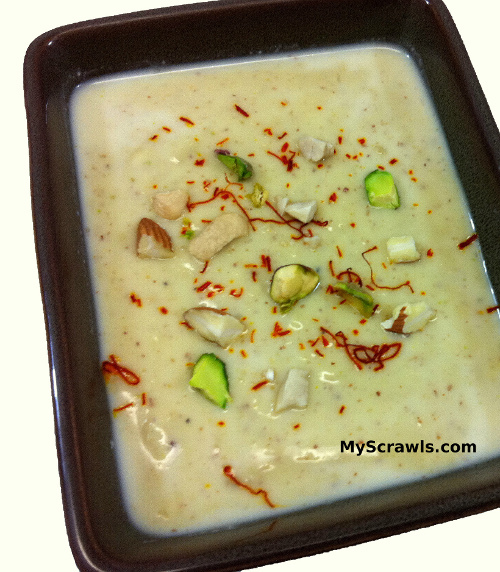 Happy to post Basandi as my 101st recipe in Anu’s Kitchen My Scrawls has crossed 135 posts with over 100 recipes! Thanks to all my readers for the continuous support. I got this recipe from fellow blogger Ajitha. Looks like she had got the recipe from some other blogger. Thanks to the internet! Its been 3 years since I have been married and cooking for my family and I hardly remember asking my mom for recipes! Internet has been my guide and fellow bloggers have been my virtual gurus! Basandi is prepared by boiling milk over low heat with continuous stirring until the milk reduces to half its quantity. Milk eventually thickness forming “Malai” (Paal eadu in tamil/cream). To speed up the process we can add sweetened condensed milk. Since its already creamy and thick it gives delicious taste to the recipe. Note: The measuring cups used here are the ones that I use for measuring baking ingredients. Grind dry nuts into fine powder (no need to peel off almond skin). Pour milk in a pan and allow it to boil. Keep stirring so that milk doesn’t stick to the sides of the pan. When milk starts boiling, lower the flame and slowly add condensed milk. Add sugar and nuts powder and stir. Ensure there are no lumps and the nuts powder is mixed very well. Heat the milk mixture in medium flame for 30-40 mins. Meanwhile heat 1 tsp of milk and dissolve saffron in it. Add it to the boiling milk and stir very well. Add cardamom powder and boil the mixture for 2 more minutes. Remove from the stove and garnish with saffron and chopped nuts. Allow basandi to cool and then refrigerate. 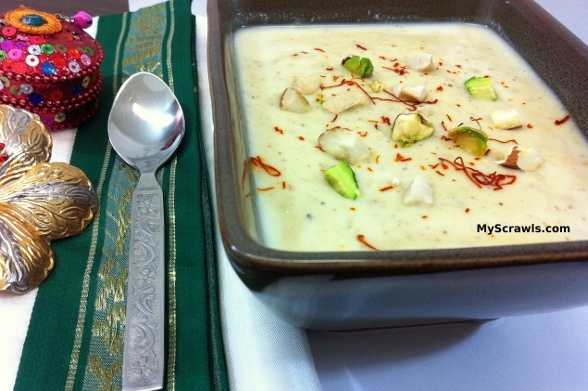 Serve chill basandi as dessert! Thanks for the feedback Aarti! Glad you liked the recipe. I tried for 1st time using your method, its so delicious and yummy. thanks a lot.